Growing, empowering and protecting the vote to make democracy work for all. District 49 Legislators, Senator Melisa Franzen, 49A Representative Heather Edelson and 49B Representative Steve Elkins will hold a Legislative Wrap-up Session. Come hear your legislators discuss what bills were passed in 2019, what bills were not and what their priorities will be for next year. There will be an opportunity for audience members to submit written questions to the panelists. 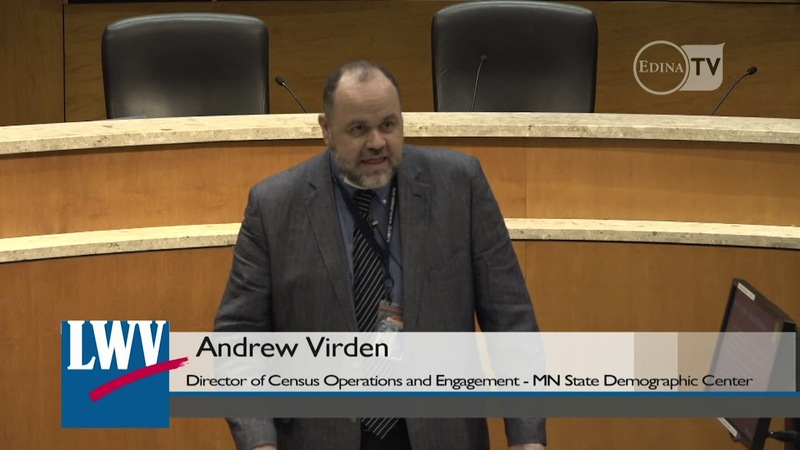 On March 28, Andrew Virden, Director of Census Operations and Engagement with the Minnesota State Demographic Center, gave a presentation on why the 2020 census is critical for states, counties, and communities.